iOS 5.1 has been in beta for a while now, but several features have remained hidden from developers thus far -- potentially including rich text formatting for the Notes app. 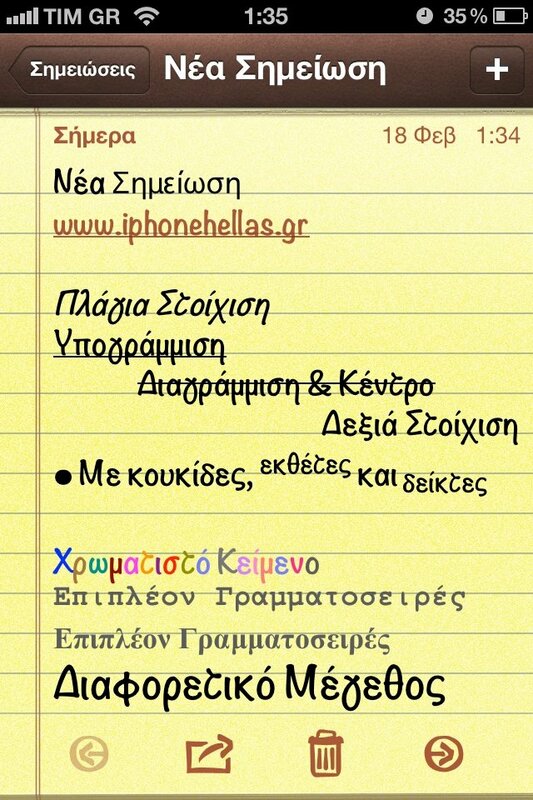 Previously limited to just plain text, iPhone Hellas reports that users will soon be able to include bulleted lists, links, underlined text, change the font color and more. OS X 10.8 Mountain Lion will be getting rich text editing in the [new Notes app for Mac, so this would mean parity between the platforms. If accurate, it's great to see Apple pushing Notes a little further, as it's been essentially the same since the early iPhone OS days. It probably won't have any effect on App Store note-taking apps, which often include additional features, or features Apple would never add, like Dropbox or Box.net support, or allow hand-writing support. Like the Photos app, it's just bare bones functionality. iOS 5.1 has been rumored to hit the streets on March 9th from operator profile code uncovered in the latest beta release, which is also right around the time we think Apple will be announcing the iPad 3.